Sunglass Hut is a retailer of sunglasses and accessories, based in Miami, Florida, USA. The company is owned by the Luxottica Group, and they employ over 9,000 people, across 2,000 retail outlet, in 20 different countries. They also sell their range online at SunglassHut.com, where you can use Sunglass Hut coupons to redeem savings and other deals. You can also use a Sunglass Hut printable coupon in-store. Optometrist Sanford L. Ziff opened the first Sunglass Hut in 1971 in Miami's Dadeland Mall. It was a kiosk and it proved successful. From this, Ziff expanded his enterprise by opening Sunglass Huts in several new locations. Fifteen years later Ziff had around 100 Sunglass Hut outlets and sales topped $24 million. The success of the franchise was such, that in 1986, Mr. Ziff sold 75% of the ownership in the company to an investment firm, Kidd, Kamm & Co. for an estimated $35 million. Ziff then retired in 1989 and his family owned 25% of the company but handle no management duties. They led that percentage until 1991 when the company's annual sales topped $100 million and they sold their remaining ownership. The company then went public in 1993, leading them to own 30% of the sunglasses market in the US. It was in 2001 that the Luxottica Group bought Sunglass Hut for an estimated $653 million. Sunglass Hut sells designer and brand name sunglasses and accessories, watches, and other items. You have categories such as Hers, His, Brands, Gift Cards, home Try On, Find Your Fit, Trends, Holidays. In Hers, you'll find new, featured, top rated, polarized, accessories, shop petite fit, shop Asian fit, Prada Ray Ban, Versace, Coach, Gucci, BVLGA. In His, you'll find, new, featured, top rated, polarized, accessories, kids, extended fit, shop Asian fit, Shop All His, Oakley, Ray Ban, Maui Jim, Persol, Dolce Gabban, Versace. Brands include, Dolce Gabbana, Michael Kors, Maui Jim, Ray Ban, Oakley, MiuMiu eyewear, Alexander McQeen, Armani Exchange, Arnette, Arnette goggle, Burberry, BVLGARI, Coach, Dior, Dolce 8 Gabbana, Emporio Armani, Giorgio Armani, Gucci, Guess. Sunglass coupons can be redeemed for any of these products by entering the code in to the box during the checkout process. A popular choice is the Sunglass Hut birthday coupon. Sunglass Hut accepts all common credit cards for payment, including MasterCard, Visa, American Express, Discover, and JCB, as well as Paypal, and their own Sunglass Hut credit card. You can also use their branded gift cards to fund all or part of your order. If you are using a Sunglass Hut coupon code this is entered just before the payment step. Free standard shipping is available on every single order for US customers, and will take between 3 and 7 business days to arrive. If you want your order faster you can also pay extra for UPS Second Business Day, which costs $8.95, and UPS Next Business Day, which costs $17.95. Canadian customers may subject to import charges and other fees outside of Sunglass Hut's pricing. 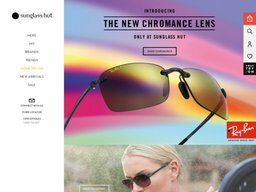 Sunglass Hut offer a 90 day free returns policy, allowing you to send back your order no questions asked, for a full refund, including return shipping costs. You can also exchange returned items. Returns can be made in store, or via UPS. You can print the prepaid label by going through the return steps within your online account's order history.